Home furnishing gurus Mitchell Gold + Bob Williams, who have hearts of gold and a soft spot for dogs, have announced a new line of exclusive pet throws. 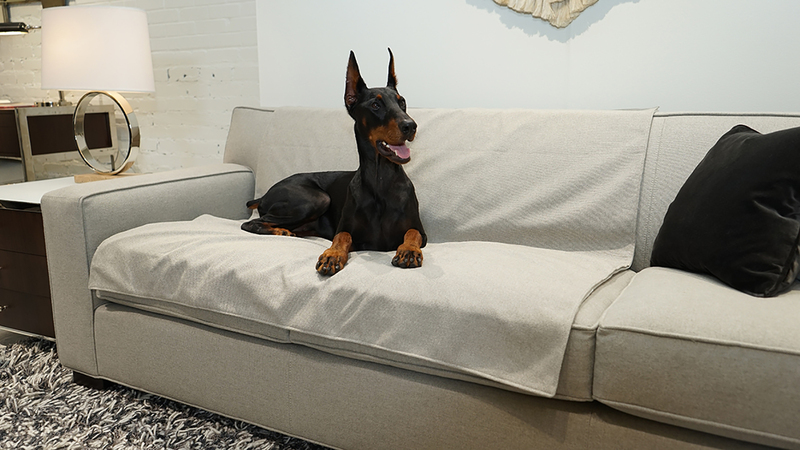 Homeowners now have a fashionable way to protect their sofas, chairs and lounges from the dog hair, stains and wear created by our four-legged friends. During the winter and headed into mud season, pet throws are a must, and mean that we don’t have to banish man’s best friend from snuggling up to us on the sofa. And when company comes? Simply remove the blanket to unveil clean seating. Zola is invited up on Mitchell Gold + Bob Williams' Jean-Luc Sofa, thanks to the 50w x 50h" pet throw. MG+BW’s pet throws come in three sizes (25w x 25”h, 50w x 50h”, and 100w x 50”) and are lined with a muslin backing for a stylish finish. They are available in the same upholstery fabric as your furniture for a monochromatic look and in any of Mitchell Gold + Bob Williams’ 300+ fabrics for a nice contrast.